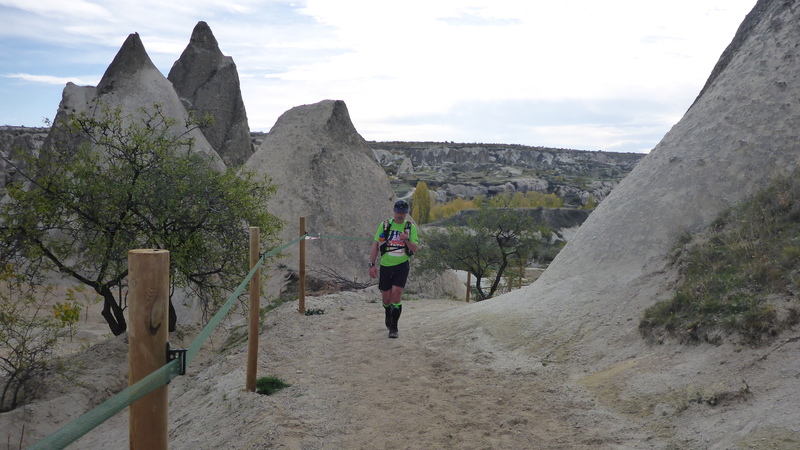 Finally, since June this year, I have enjoyed a run, the North Face Cappadocia Ultra Trail. Not only because it was the first time in months that I started an event without an injury but also because Cappadocia trails are some of the most magnificent in the World and the organisation, by the runner/mountaineer twins Serkan and Sertan Girgin, was flawless. I can see Serkan and Sertan, both incredible runners, professionals and academics, collecting best practices from all the runs they have ever done (and they have completed a few) and picking the best pieces from them to create this event. No wonder The North Face became its name sponsor it in its inaugural year. I cannot congratulate them enough. 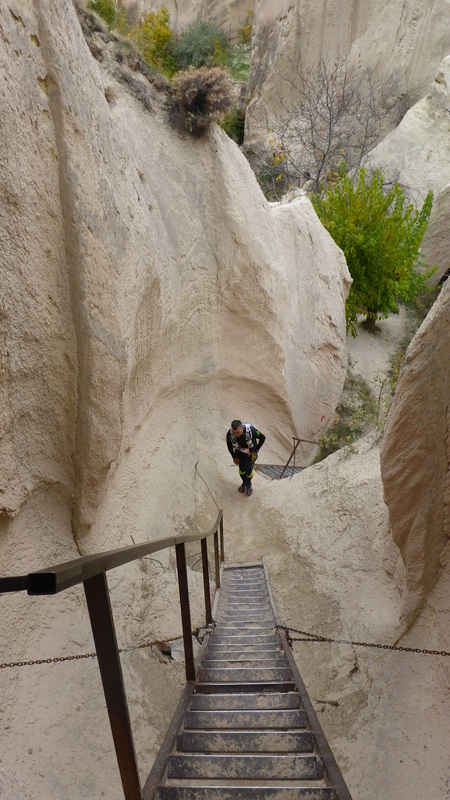 Cappadocia, is a UNESCO world heritage site with exceptional natural wonders and a peerless historical heritage, its hills and valleys and natural trails makes it an ideal location for a trail ultra. Bill Coyle and I, flew into Kayseri (ASR) Friday afternoon. We both felt very unprepared, Bill had barely run since finishing UTMB at the end of August, I had done a cumulative distance of 83km since dropping out of TDG with an ankle injury in early September. We agreed that we would hike the whole distance, as if, hiking 110km was much easier. Ultra runners have a tendency to persuade each other to take on some incredibly silly challenges. We registered with the event, checked into our Hotel (Ürgüp Evi – a great little cave hotel with one major disadvantage, despite being only 800m from the finish line it is 100m higher), had a quick dinner at Çırağan Han and were taped up and in bed by 9pm. Well at least that was the plan, it was more like 11.30pm when I rolled in. I am new to taping my ankles and it still takes me a few times to get it right. 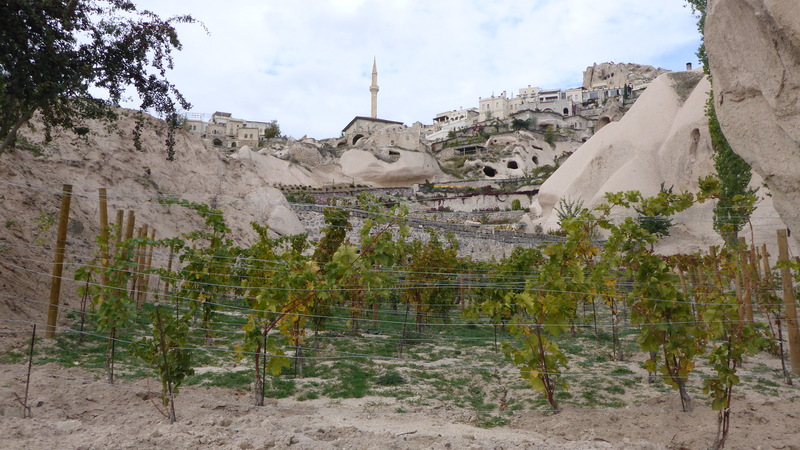 The Cappadocia region has been a tourist attraction for a number of years. As a result the tourism industry is well developed. Therefore, there are many good hotels and restaurants to choose from. The event site has a good list. 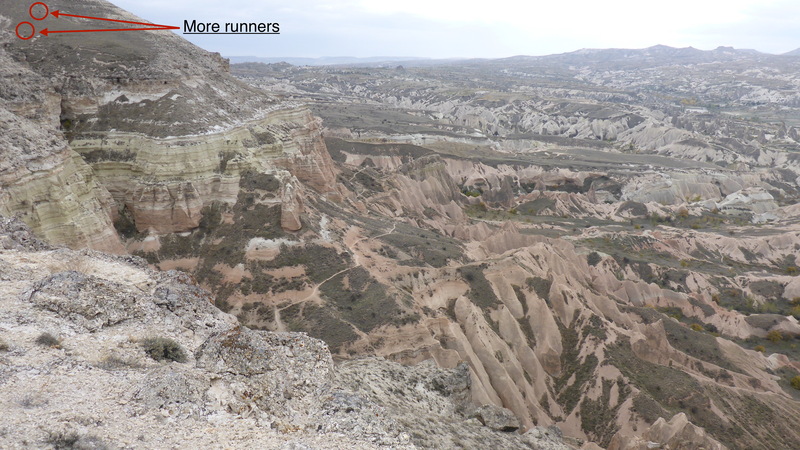 This is a race of two parts; first 60km in the Cappadocia Natural Park with good trails, easy and short ascents and descents, and then the second part, most likely in the dark (sun sets at around 6pm) through three hills almost without trails. Here the ascends are slow and the descends are even slower! The race has an early start, 7am. In fact, one recommendation for the organisers is to start the 110km at night and in the opposite direction (more on this later on). The first 60km is simply spectacular (at times breathtaking). 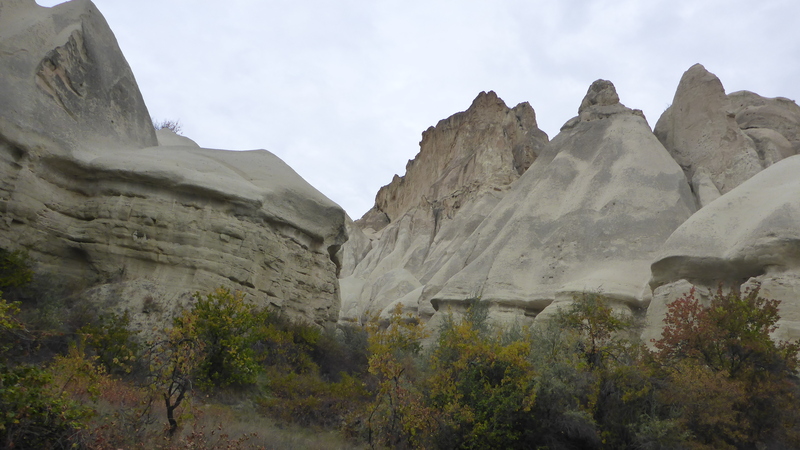 Imagine the posters of Cappadocia rolling in front of you through canyons, caves, valleys, tunnels and hills. There isn’t a moment without something spectacular to look at. The race in total has 3,300m vertical gain and loss. During the first 60km you don’t feel this much, with the exception of one, most climbs are rather tame and short. The only one that may make you finch a little is just before checkpoint 4 at km 45, this is a 300m climb on a steep rocky and grass covered terrain without a trail. The descents on this part of the race are perfect for running. Checkpoint 1, came pretty quick, a little too quick for my liking. The Checkpoint is on the terrace of the village cafe at İbrahimpaşa. Checkpoints were well stocked and we were given a list of what to expect at each one. It is possible to complete this event with little food of your own. At CP 6 back in Ürgüp you can even have a cooked meal and coffee (as I said best practices collected from many races). Checkpoint 2, is at a Hotel in the village of Uçhisar. This was one of the most beautiful approaches. Again perched on a hill but this time with vineyards on its terraces. The region is famous for its wines. Definitely make some time after (or before) the event to taste a few. Some of the more beautiful and challenging (of the first part of the event) sections are from CP 2 and CP 4. The organisers tried to have a section go through an underground city, however, these were built for protection, therefore they have a limited number of and small entry/exit points, which made it difficult (and dangerous) to have several dozen people run in and out. 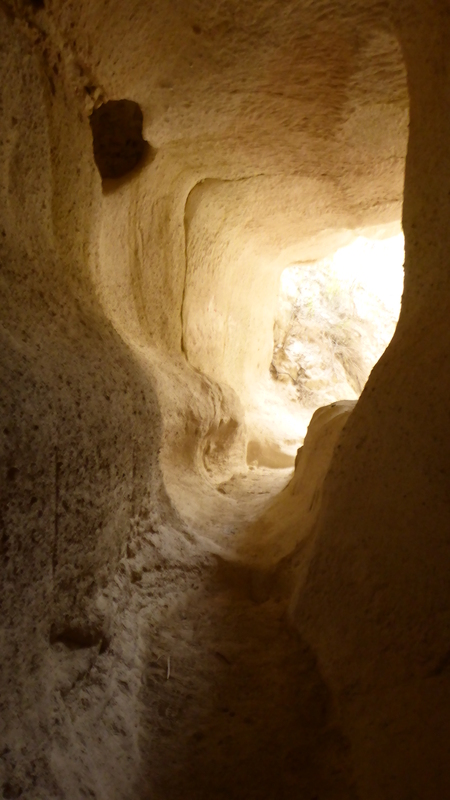 Instead, they made sure there were plenty of tunnels, some you had to crawl through. And the climb before CP5, not the longest climb but the steepest and partly on rough ground, with many fake peaks, every time you thought “that’s it I am done” you can spot another peak with more runners in the distance still climbing! The descent from CP5 back to Ürgüp was welcoming, first a relatively flat section on the plateau, then an easy and runnable descent to Ürgüp with the exception of a final short but steep climb and a very steep descent (from our hotel) to the CP. Checkpoint 6 has everything you need at a main checkpoint, a hot meal, coffee, massage, showers (with hot water) and even the option to stop and get the 60km finishers medal! I decided to move on, had a quick meal, hydrated and changed into warmer clothes. I knew the second part was going to be slower; fatigued, harder terrain, dark, higher altitude, colder and lonelier. Unfortunately, all my worries proved to be true. By the time, I got to the bottom of the first hill, it was almost dark. I resisted turning on my headlamp. I was in denial, almost wishing the darkness away. After a while it was futile. I could no longer see the flags. That made me think about to the local kids I encountered as I was leaving the city. They had pointed to a hill at the edge of the city and said that I was meant to go there. As I walked away from them they waived the marker flags in their hands and bragged that I would not make it as they had stolen the flags! Was it the darkness or were there no flags to be seen? Unwillingly, I took out, wore and turned on my headlamp and could see the reflective tapes in the distance but there were hardly enough of them. I decided to make a beeline to the top of the hill in hope that the kids did not get to the flags on the other side. If they did I was in real trouble. Once I flashed my headlamp towards the valley at the other side of the peak, I could not only see a shining line of reflective tape going all the way down to the bottom of the valley but another line going up a gorge at the other side! The steep and uncertain climb had exhausted me, at that point, I wished I could just jump and land at the other peak , even seriously thought about it (after being on your feet for over 12 hours that feels strangely plausible). 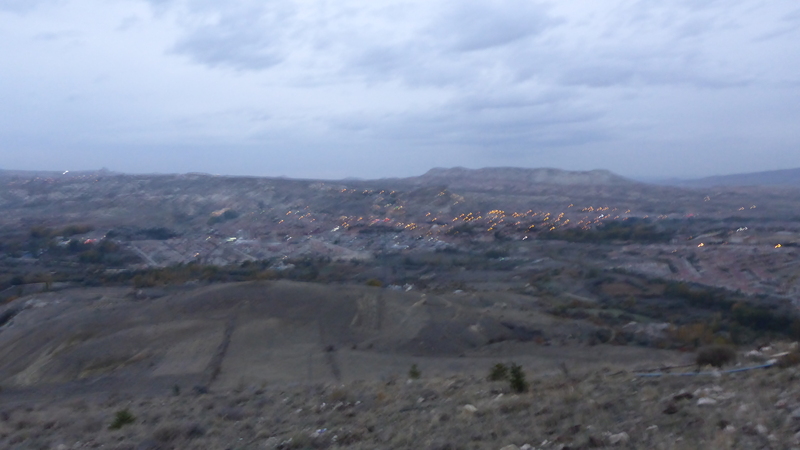 Instead I took one last photo of Ürgüp (don’t be cheated by the brightness, it is all on modern technology, in reality it was pitch black) before I started the steep and rough descent on loose rock/stones (a theme that was to repeat several times over the next 40km) and thorny bush. The expected rain finally started coming down. It was not strong and normally I would not have bothered with my shell, at first I did not. However, as the wind picked up and the temperature dropped I decided to cover up. Checkpoint 7 was a welcome sight, I was cold but they had a wood fire going. I warmed up, got some food and desperately looked for a friend. There were many runners who decided to stop at this checkpoint. I eventually found someone willing to move on. He was fresher than I was, at first I had a lot of trouble keeping up with him but I was desperate. It is always good to have someone on a long run, especially at night. We managed to stick together till just before CP8. There were a few hills just before CP8 and I decided to use them to wake myself up. I treated them as hill reps, pushing hard up (hard here is very relative) and resting as I tumbled down with gravity. I knew CP8 was near and I could refuel and rest there. I also knew Aykut was there, a seasoned runner, and he would help me pick up my spirits. Checkpoint 8 is in an old and run down brick house at the edge of the village. But that did not matter, they had a nice fire, the local kids were around despite the late hour and were all very curious about the race. I waited around for my friend to catch up but he did not show. Eventually, I had to get up and start moving again. Aykut, went the other way looking for him. As it turns out, while I was warming up inside the house, he missed the CP and continued. By now, I was delirious, high on another plateau, cold and being blown away by wind, I caught myself wondering off the path several times. There were large gaps in my memory and at times I could not remember the last flag. I did not want to get lost! I tried running but my legs were not responding, music did not help either, I had to resort to caffeine gums that were recommended by Jeri Chua for TDG. I never got to use them there. I had never tested them before but they were my last hope. I took one, a short while later my mind was as clear as it had ever been and I was running (scary)!!! The effect, however, lasted only for an hour or so. It was not long before I had to admit to myself that I might have missed a turn. I had been telling myself that the reflectors on the side of the road were put there by the organisers and not the national transport agency. My denial, lasted for 2km, that’s when I called Serkan, in hope that he can guide me to CP9. Instead, Serkan politely asked me to turn back and find the correct path. I did (proof in the photo)! The backtrack was painful, the turning point was blatantly clear and now I had to cover the same distance only a few metres to the East of my previous track. Checkpoint 9 was unspectacular, it is set in the village coffee shop where the young boys where playing a local card game and smoking at 2am in the morning, what a waste! By then, I was the last person in the event but I had a nice buffer between myself and the cut off. I was going to finish. The last section (especially in the dark) is a blur. It is mostly by a river, so I assume it was a canyon. I also remember that there were many dogs along the way, at times I could hear them bark from just around the bushes but fortunately none of them wanted to deal with the man with light coming off his head! Being the last one to finish is not always the best experience but this time it was special. After two injury driven DNFs, a finish on a course like this was special! Over the years, I have made many friends on the trails, mostly two-legged. But a few included fury four-legged ones. Dogs seem to have an affinity for ultra runners, it might be because we smell alike. Every so often, I get followed by a dog for significant distances at the most isolated places in the World. Their company is always welcome. I came across this chap at Mustafapaşa (104km) and for the following 10km till the finish line he did not leave my side. Even after the finish he was still there. The photo was taken as I was getting ready for a quick recovery massage (yes they even had massage at 2am in the morning) while he stood guard outside the tent! Running at night, alone and cold, I wished that this section was the first of the race. I would have enjoyed it more with fresh legs and a few people around. 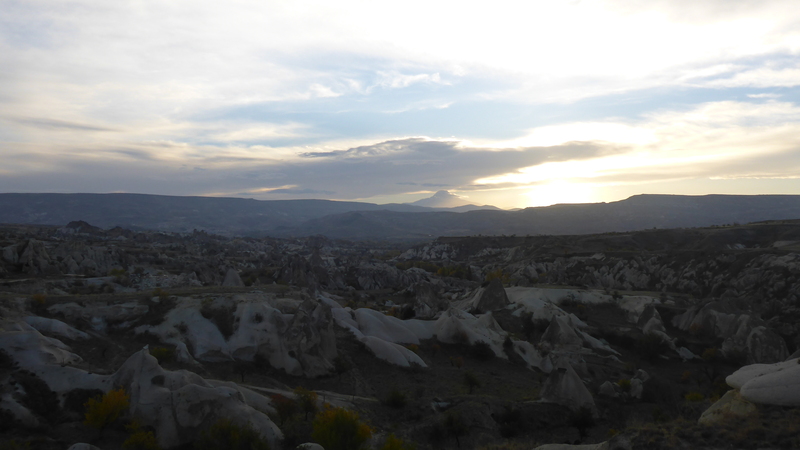 However, the original first section through Cappadocia Natural Park must be run in daylight to enjoy the natural beauty. Therefore, I wonder if this race can be run in reverse and started at night? I realise the logistical burden this would create. Notice the D tour around Mustafapaşa!! !